From left, California Gov. 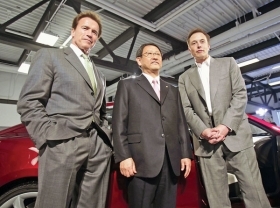 Arnold Schwarzenegger, Toyota President Akio Toyoda and Tesla CEO Elon Musk announced the Toyota-Tesla deal last week. The plan calls for Tesla -- and perhaps someday Toyota -- EVs built in Fremont, Calif.
PALO ALTO, Calif. -- The surprising tie-up between giant Toyota and upstart Tesla Motors fills gaping holes in each company's strategic portfolio. Tesla needed a turnkey plant to build electric vehicles scheduled to arrive in 2012. Toyota gets a technology think tank at a time when its own engineers are focused more on improving quality than on next-generation green powertrains. Joint development and engineering of electric vehicles are part of the deal, which eventually could lead to Toyota-badged vehicles coming out of the Tesla plant. Gaining access to Toyota's vaunted product development and production systems is a coup for little Tesla. "We will create electric vehicles together," said Tesla CEO Elon Musk. Tesla will acquire the now-shuttered New United Motor Manufacturing Inc. plant in Fremont, Calif. In fact, the agreement undoes some of the bad press Toyota received when it closed NUMMI, which is across San Francisco Bay from Tesla's headquarters. Toyota had shared the plant with General Motors. But when GM pulled out of the joint venture last year, Toyota called the plant too inefficient to keep open. The plant initially will have about 1,000 employees, but Musk said the number eventually will reach nearly 10,000 when combined with a supplier park on-site. "That's where NUMMI is great," he said. "It's designed for high-volume, efficient production." Toyota executives said they were intrigued by Tesla's ability to get extended driving range with relatively large, sporty cars from lithium ion batteries. Toyota still uses older-tech nickel-metal hydride batteries in its hybrids. "This brings a totally new outlook for our understanding of what electric vehicles should be," said Paul Nolasco, a Toyota spokesman in Japan. "Tesla brought home to us that an electric vehicle can be beyond short range." Toyota's entry into the EV segment in 2012 is expected to be a small, short-range model suited to urban driving. Tesla now builds its $109,000 Roadster and will follow with the $40,000 Model S sedan in 2012. The Model S will account for about 20,000 units a year, occupying "a little corner" of the NUMMI plant, Musk said. But he said other models will be based on the Model S platform, allowing for "hundreds of thousands" of units annually. He said the two companies could also co-develop a vehicle that would also wear the Toyota badge. "We are not holding our technology close to our vest," Musk said. "We want it out there as much as possible." Toyota hasn't decided what models it might develop with Tesla or what branding and sales channels would be used, a spokesman said. The price of the NUMMI plant was not disclosed, but Musk said Tesla likely would spend "a couple of hundred million dollars" renovating the facility. That cost will be covered by $465 million in Department of Energy loans that will fund Tesla's manufacturing ramp-up, as well as development of the Model S.
Toyota will invest $50 million in Tesla in exchange for 2.5 percent of the company's upcoming initial public offering. The agreement was signed off by Daimler AG, Tesla's original automaker partner. Daimler also gave Tesla $50 million last year. Daimler "has lots of cross-shareholdings," Musk said. "They ... wanted us to go out there" and look for partners.